Estate Regina started in 1998, on initiative of some young Florentine musicians and musicians from the Maggio Musicale Fiorentino Orchestra, with the support of the Town Council of Montecatini Terme, Terme di Montecatini, and hotel associations. 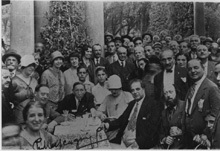 Since the beginning the aim of the initiative was rediscovering and valorizing, in an original and innovative manner, the great cultural and musical tradition of Montecatini and in particular of its Spa which was in the past a privileged meeting place for poets, painters and, most of all for great musicians such as Gioacchino Rossini, Giuseppe Verdi, Giacomo Puccini, Pietro Mascagni, Ruggero Leoncavallo, Richard Strauss, Umberto Giordano, Ildebrando Pizzetti, Arturo Toscanini, Enrico Caruso and many others. Montecatini was the place where a number of projects and important partnerships began, where the premieres of many operas were performed and where great works in the history of music were composed, including Otello, Falstaff, la Bohéme, la Fanciulla del West. Montecatini is also linked to the birth of Maggio Musicale Fiorentino through the summer season of what was once called Orchestra Stabile Fiorentina. Estate Regina has brought this tradition back to life with a music festival running from June to September offering many concerts and performances in the spectacular venue of the Tettuccio Spa in Montecatini. The festival artistic direction is entrusted to Yehezkel Yerushalmi and Vittoria Ottaviani. Besides the Regina Orchestra, founded and entirely composed of musicians from Maggio Musicale Fiorentino, the festival has seen the participation of many internationally famous musicians and actors such as Zubin Mehta, Uto Ughi, Luciano Berio, Ivor Bolton, Yuri Ahronovic, Daniel Oren, Michele Placido, Salvatore Sciarrino. Built in 1771 by the Grand-Duke Pietro Leopoldo, a clear expression of the Habsburg-Lorraine culture, the Spa of Montecatini soon became a meeting place for the cultural élite of the period, a place where music soon became protagonist. An interesting picture of the European musical culture of the Habsburg-Lorraine period can be found in the Venturi Music Fond, a vast collection of books and manuscripts belonging to the Town Council of Montecatini Terme dating back to the origin of its thermal baths. Many composers began to spend long periods of rest, recovery and study in the spa town, starting with Gioachino Rossini, who used to stay at the "Locanda Maggiore", where his music room is still conserved today. 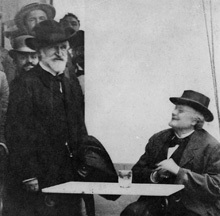 Giuseppe Verdi from 1882 until the year of his death spent his summer holidays here and Montecatini became his adoptive summer residence. Here he would meet Arrigo Boito and Giulio Ricordi and here he composed the third act of Otello and completed Falstaff orchestration. In Montecatini it's still possible to play his piano, conserved at the Art Academy together with relics of various types: his personal possessions, photographs, documents written in his own hand. Giacomo Puccini too was a frequent visitor to Montecatini. Fanciulla del West was composed mainly in Montecatini Alto, and similarly it was in the surrounding area that the third act of the Boheme was composed. At the spa café he would discuss projects for new operas with a brilliant, young journalist from "Il Tettuccio" journal: Gioacchino Forzano. He was to become the librettist of Suor Angelica and Gianni Schicchi as well as the direct of Puccini's operas. 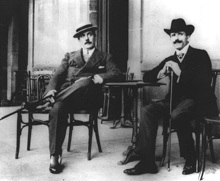 Together, Puccini and Forzano would meet Arturo Toscanini and Enrico Caruso to discuss the new scenery. 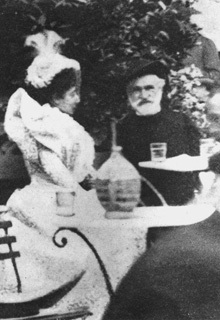 They were to meet for the last time at the Gran Hotel & La Pace to define the details of the staging of Turandot which the composer was working on and the direction of which was entrusted to the Montecatini man of letters, while Toscanini was to direct it at the Scala on 25 April 1926. In Montecatini Puccini also used to meet Pietro Mascagni, the author of Cavalleria Rusticana, his long-time friend and he too a frequent visitor to the spa. It was with him that in 1919 he attended the funeral of Ruggero Leoncavallo in Montecatini confirming, despite moments of personal incomprehension, the artistic ideals and human goals shared by the protagonists of the young Italian musical school. Leoncavallo too, after appearing as an occasional summer visitor to Montecatini, moved there permanently in 1913 and became one of the key figures of the musical and worldly life of the town. Among the musicians visiting the spa we still remember Richard Strauss, Alberto Franchetti (who used to come to Montecatini with D'Annunzio), Umberto Giordano, Riccardo Zandonai and Ildebrando Pizzetti.